The Corellian/B-Wing Ugly, which is also known as the C-Wing Ugly in pilot jargon, is a small starfighter occasionally seen in more remote corners of the galaxy. Like most uglies, the C-Wing was designed and built by those who needed fighters but lacked the money, materials or connections to get their hands on a more popular (and usually more capable) model. Like most uglies, it can be cobbled together quickly, taking the attributes of multiple crafts and yet, somehow, seeming to leave out the best components of each. The C-Wing pieces together the majority of a B-Wing fighter-bomber's body with the cockpit of a YT-series light freighter. It is a mystery as to who actually designed the first C-Wing Ugly, though it is speculated that it was pirates who used wreckage from various battles to create one of these cheap starfighters. As an amalgamation of scavenged systems and components, the ship often suffers mechanical and technical problems and thus rarely operates at optimum levels. As one would expect from an ugly, in addition to being quick to produce, C-Wings are cheap and have an abundance of spare parts available. However, this cheapness does lead to a number of issues; the ships are never standardized, so a method of repairing one may not work for a similar problem on another. This failing is compounded by the fact that uglies in general have an unfortunate habit of falling apart at inconvenient times, such as when one is trying to outrun a local patrol bent on boarding and inspecting the cargo being carried. Faster at sublight speeds than its B-Wing forbearer, the C-Wing Ugly's increased engine output comes at the cost of a smaller hyperdrive unit and far fewer weapons so as to not overtax the fighter's power plant. The YT-series cockpit gives the craft space for a pilot and three passengers, and contains an access corridor to the reactor, which enables quick repairs of the piecemeal electrical systems. As is normal with uglies, the C-Wing performs moderately well against lightly shielded and lightly armed opponents. Discretion, however would be the better part of valor if one were to come up against a ship with anything resembling a real shielding system and passable weapons. 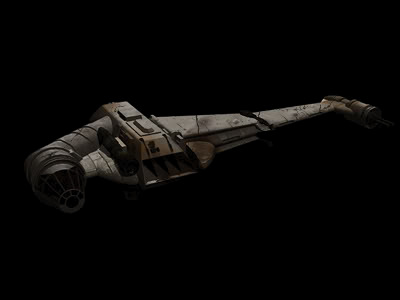 The C-Wing Ugly is primarily used by pirates for hit and run missions on unarmed transports and is only used as a line fighter by the desperate.